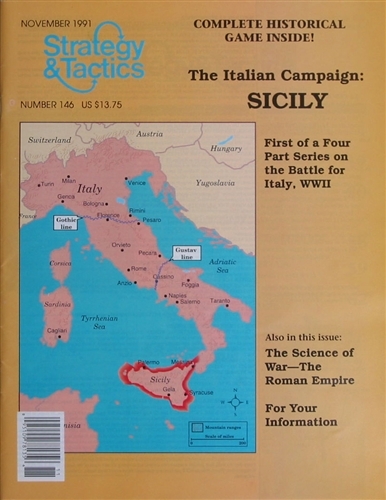 The first of four operational level games (Sicily, Salerno, Anzio-#155 and Med War- #160) simulating the Battle for Italy in World War II using the Westwar Gaming System developed by Vanguard Games. This game represents the Allied invasion of Sicily. The Allies are trying to force the Axis player to completely evacuate the island of Sicily, if they can manage to capture and hold Messina for two complete turns, they force a surrender. 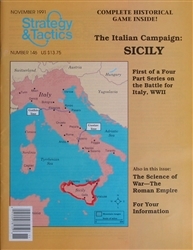 Victory points are calculated based on the number of German/Italian units captured or eliminated; the difference between this total and the Allied Landing Capacity determines who wins.